One of the great things about Upwork is how easy it is to post jobs and hire people with this platform. As a result of this ease, a mammoth amount of jobs are posted each day. And since there are so many posts, you may have a hard time finding those that are truly worth your time. Many posts on Upwork have price rates that may be too low for you. Many others may be fixed price jobs, and you may be in need of a long term, hourly position. Or perhaps you only have 20 hours a week to work online and are thus seeking a part time position. This post will show you a great way to find jobs using filters. These filters will help you find high paying, suitable jobs quite easily. Job post filters are displayed on the left side of all lists of jobs. This is true whether you clicked on one of your categories to view the jobs under it, or you searched for jobs with the search bar at the top. Let’s see how these filters can help you select high paying, suitable jobs. You can use the “Experience Level” filter to select high paying jobs. By default, all experience levels are checked but if you only want to see jobs that pay more, unselect “Entry Level.” To further restrict the jobs displayed to those with the highest pay, also unselect “Intermediate.” The result is that only very high paying jobs intended for experts are displayed. Don’t shy away from applying for such jobs. Expert seems like a big word but as long as you have been performing the tasks required for some time and are quite good at them, you should seek for and apply to expert jobs. Personally, I prefer hourly jobs over fixed price jobs. In fact most freelancers feel the same way, and for good reason. Each hour worked on an hourly position is immediate credited to your Upwork account, so you get paid as you work. On the other hand, when (and if) you get paid on a fixed rate job is in the discretion of the client. If you want to restrict the job posts displayed to hourly jobs only, you can do this with the “Job Type” filter. Simply unselect ”Fixed Price” to restrict the job posts displayed to hourly jobs. When applying for jobs, I also tend to select those that would last for some time. Applying to a short gig, getting it, closing it, applying to yet another, ad infinitum, isn’t really my thing. I prefer jobs that go on for a few weeks, months, or even years. 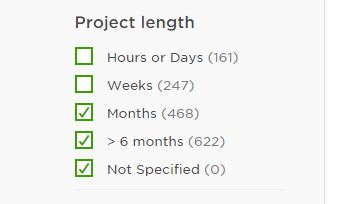 If you feel the same way, you can reduce the job post displayed to long term jobs only using the “Project Length” filter. You can unselect short term jobs, which means the system would only display jobs that would last a while. For example, if you unselect “Hours or Days” and “Weeks”, only jobs posts that last at least a month will be displayed. Your experience at Upwork depends largely on the kind of clients you choose to work with. If you run into terrible clients, you’d hate Upwork. In truth, it’s not just about getting the next gig from whoever offers it. I vet my clients as they do me because I don’t want to run into disputes which could ruin my performance ratings. One good way to select better clients is to choose those that have a good track record. You can do this by limiting the job posts you see to only those from clients who have done some jobs previously, and then ascertaining their previous jobs were also successful by viewing freelancer feedback. This also helps save your precious time because apparently, some people post jobs because “posting is fun”. How else would you explain “20 job posts, 0 hires”? To limit clients, use the “Client History” section. Simply unselect “No Hires” and only clients with some past hires are displayed. However, I have to mention that my best job at Upwork so far came from a client who had no previous work history. Thus, I prefer not to limit clients, instead I vet each client. If a client has posted 10 jobs and hired no one, or has received bad reviews from freelancers, I hit the back button in a hurry. 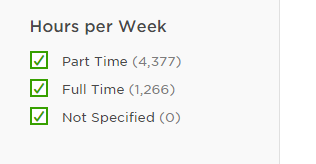 You can use the “Hours Per Week” filter to select part time or full time positions. If you only want part time positions for example, simply unselect “Full Time” from the options. 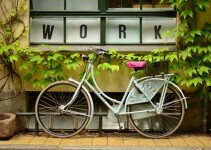 Few freelancers are aware that one of the best ways to get jobs (especially if you are new to Upwork) is by selecting jobs intended for your country, and you can view such jobs using the “Location” filter. Simply select your country (or any other country) to limit the list of jobs displayed to country specific ones. If you are seeking fixed price jobs, you can limit the jobs displayed to only those that fall within a selected budget using the “Budget (Fixed Price)” filter. In the picture above, I moved the sliders so that only jobs that pay between 250 and 5000 dollars are displayed. You may not use all the filters covered in this post, but it is very important that you choose a few that will help you save your time and score the best jobs. For example, if you need higher paying jobs, I recommend that you use the Experience Level filter to select clients who are willing to pay top dollar. Also, if you only want hourly jobs, it is wise to restrict the list using the Job Type filter. Of course after selecting the best jobs, the next step is to wow the client and score the job. Please read this post to find out how to write cover letters that employers can’t resist. If you have any questions, drop a comment below and I’d be happy to help you with it.